And that’s only the tip of the iceberg. In addition, many of his characters are dealing with severe mental illness. Schizophrenia, mania, and depression all play major roles in stories. The characters’ situations are made more uncomfortable, because the characters have made conscious (and, often, objectively bad) decisions that landed them where they are (like going off of their meds). Some of the stories made me cringe. Some made me frown. Some made me straight-up shudder. They’re not scary. They’re just . . . uncomfortable. They are also really, really well written (which explains the visceral reaction). The dialogue, especially, is great (“I used to cast fire from the tips of my fingers some weeks and burn everything in my path and it was all progress and it was all incredibly, incredibly beautiful.”). The stories are character-driven and made more interesting by their characters’ complex, conflicted relationships. 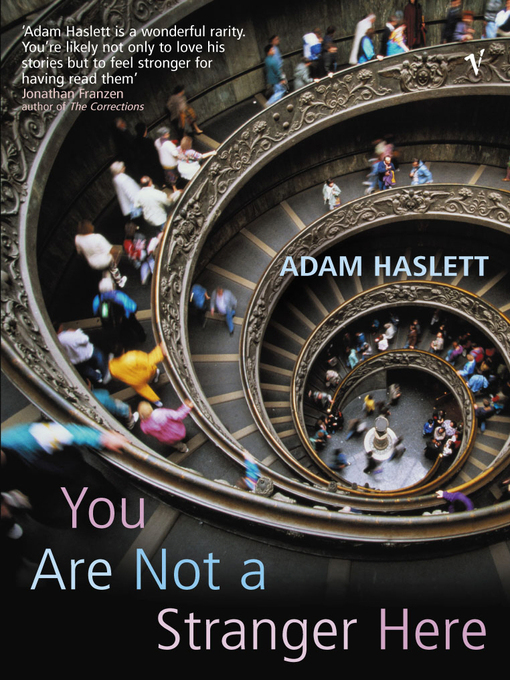 Haslett pulls you in multiple directions emotionally—you understand a kid’s desire to feel something (anything) after his parents have died, but you hate the outlets he chooses and the relationship dynamics he creates. Haslett elicits deep empathy for characters that are flawed and hurt and ill. The first two stories are the strongest in the collection. I raced through them, and they left me a little breathless and exhausted. None of the rest of the stories quite live up to those first two, but they are all pretty darn good. In case you haven’t gleaned this yet, allow me to be explicit: this is not light reading. Who should read it: Sergio (i.e., people who have an odd (misplaced?) affinity for the word “portico,” which is employed herein); Rick (i.e., people who teach counseling courses and might be able to incorporate some of these stories into their syllabi). For a taste of Haslett’s writing: visit his website. There is an excerpt from his full-length novel, Union Atlantic, published in 2009, as well as links to some of his short stories. Book-club aside: I read this book for a book club. I wrote this review before I went to the book club meeting to make sure that it wasn’t influenced by others’ thoughts and opinions. But, following the meeting, I have this to add: despite the subject matter, all eight people (3 guys, 5 women; various ages) thought the book was GREAT. This entry was posted in Rating: 4/5 and tagged Adam Haslett, Book review, Books, Short stories, You Are Not a Stranger Here. Bookmark the permalink. Probably need to get these stories now too. You SHOULD read this collection; I think you’d enjoy it. As for my “mad sklz,” thank you. Please know that I thrive on your resentment. I consign myself to the role of Amadeus and will now leave to kick a dog. Random reference . . . but if we’re going with it, then I think we can all agree you’re Salieri. And for the love of all things kind and good, please don’t hurt any animals. It’s in poor taste. Salieri is correct and I resent you more now. (Took my parents to see that movie decades ago and we doubled over when a lady of a certain age said out loud “I thought this was about Mozart. Who’s this Amadeus kid?” I have now turned into her. And no dogs will be hurt in this production.